Still looking for a place to stay during the Harley-Davidson 110th Anniversary Celebration in Milwaukee? 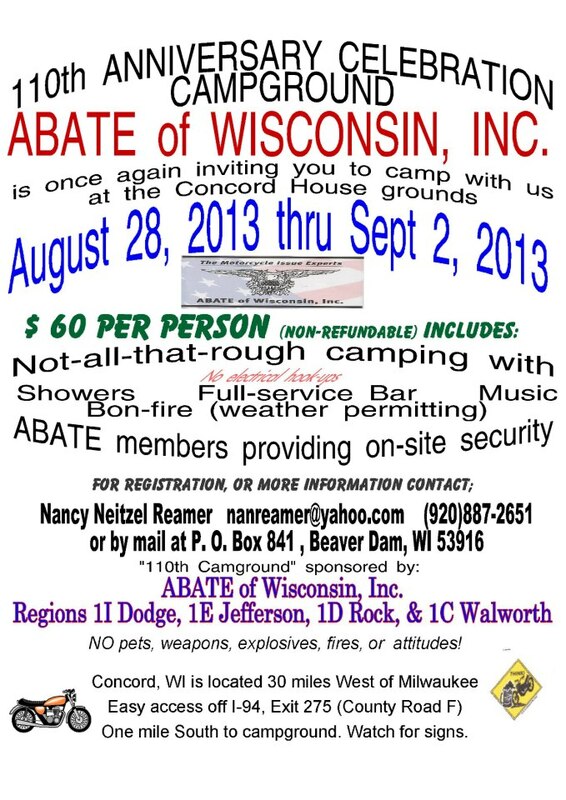 ABATE of Wisconsin, Inc. is hosting camping at the Concord House August 28 through September 2, 2013. We have showers, a full bar, music, bonfires and security. No electrical hookups are available. Please no pets, weapons, explosives or fires. $60/person (non-refundable), open to the public. We’re 30 miles west of Milwaukee with easy access of I-94 (5 minutes from the highway). Take the Ixonia exit 275, a left on F and a left on Concord Center Drive.